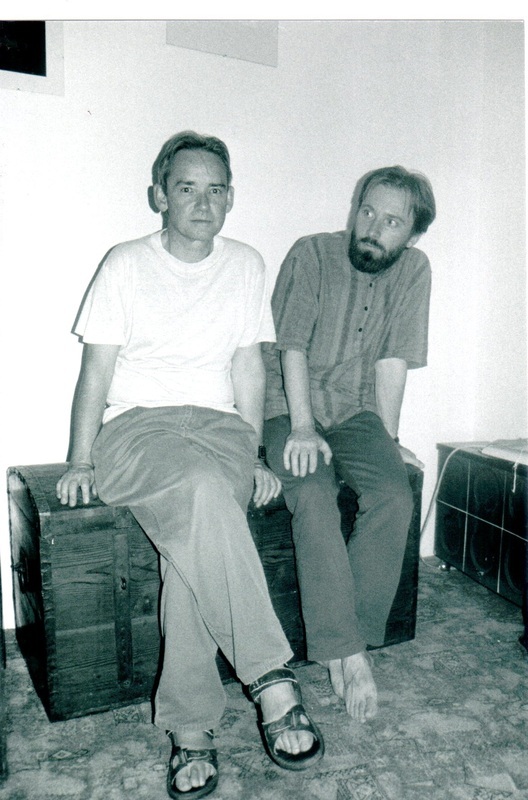 In the 1992 Maciej Bielawski came into my monastery in the United States. Once settled, in free moments he used to pick up a guitar lying about in the studio of the monastery's iconographer and began to pluck its strings in a beautiful order. This was soothing and helpful for the icongrapher as he worked. The two grew close to each other in this way, passing many hours together with no words exchanged, the one busy with his paints and designs, the other with his meditative music. Maciej was doing more than just random straying among the notes, though he could do that well. He was remembering and completing the compositions he had begun many years before. Now at last he had the time to search out and find where his initial inspiration wanted the sounds to be led. These were meditative compositions — some joyful, others mournful, energetic, playful, lively. But they all had a characteristic that I especially enjoyed in my listening: there was a sense of the sound wanting to go in a particular direction, a mysterious and unexpected direction and Maciej was simply letting himself be led by the energy of the sound's impulse. He was docile to it. The music was beautiful because he yielded to the sound's desire to go where it wanted to go. In this same period I was continuing to write poems as I had long already done. One day I was suddenly struck by a connection between Maciej's music and my poetry. What I was noticing in the way sound led his music was similar to something I was trying to let happen as I wrote poems. I found that words and phrases, in virtue of their particular and precise sounds (always wondrous and beautiful! ), also had a place they wanted to go. They wanted this next sound, this next word, this next phrase beside them. My task as poet was to listen carefully and find these. I could find them better with a generous silence around each word. Then I could hear how strong, how lovely, each word is. I could hear its unique force and what sound it wanted next to it. Fortunately, the best sounds happen also to make good sense. And so I was finding my way to a sense that I would not otherwise have found had I not let sound direct me so strongly. Call it a kind of music, and then the reason for our experiment becomes clear. Our experiment was to sound the music and the poems together. The silent space around a word or phrase contains a hidden music. Waiting and listening, one finds it. It contains immense wealth, more than could ever be mined in a finite, delimited moment. But in any given moment some of the word's glory can be let to shine. It is heard as music. Then the music drives, and time passes, music's time, music's rhythm, music's beat— like a word, like a language, a statement, something said, a story, the mystery ex-pressed. Maciej's music was written; my poems were done. We did not write for each other, neither my poems for his music, nor his music for my poems. We wanted to put together what we had separately done. We had to decide how best to do so. This is how we worked: I would listen to one piece of music, hearing it as carefully as I could, feeling its moods and particular drives. From an available store of poems, I would eventually choose one whose drive and movement were similar or complimentary. Then, we would simply sound them together. My reading had to be larger and slower than I would read if I were doing so without music. And I had to place longer pauses between lines and stanzas. This gave space for the music to unfold, to become part of the same something. There was not an exact way it had to be done, that is, exactly this phrase from the poem with that phrase of the song. It was looser and more spontaneous than that. We had to be flexible and sensitive to one another during the performance. Then we found that each time it could be something new, a fresh improvisation around a familiar theme. We enjoyed this. We just did it for the doing, rather like one might just sit down and play the piano for the joy of doing so. We intended no audience, but if someone were around, well, of course, we might say, "Listen to this." And then we would do one or two of our improvisations. When others heard it, they seemed to like it as we did. Naturally we were pleased. For Christmas that year (still 1992) we decided to record some of our pieces and use the recording as a gift for a few of our friends. We used the monastery's best equipment and took care to make something as nice as possible; the whole project was home grown and private.